A nature preserve and teaching centre. In the late 1970’s the Garden Club committed $60,000 to plan and plant a wildflower sanctuary for Metropolitan Toronto. It was to be a place of natural beauty for everyone to enjoy, an outdoor environmental classroom and a place to preserve wildflowers of Southern Ontario. An attractive wooded site at Humber Arboretum was chosen. 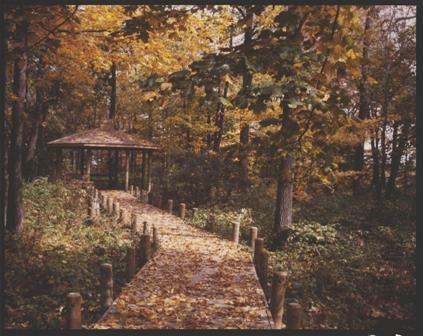 Paths and raised boardwalks were constructed; indigenous shrubs and plants were added. An Orientation Building, given by the Dunington Grubb Foundation and Wintario, houses exhibits and displays. Three qualified nature interpreters bring the many aspects of the natural world to over 8,000 students of all ages, annually, in a year-round program of classes and courses.